They bought their house in Westwood because of the beautiful yard, so they added a big window and made everything work around it. Kate and Dave Lefcourt bought their home in Westwood because of the yard. While house hunting four years ago, they walked in the front door and went straight out the back, lured by the landscape. “It’s got a beautiful, very private backyard,” says Kate Lefcourt. The trouble was, they couldn’t see it clearly from the kitchen, which dated to the 1960s. “There’s this gorgeous view out back, but they had this rinky-dink window over the sink,” says designer Sarah Scales. 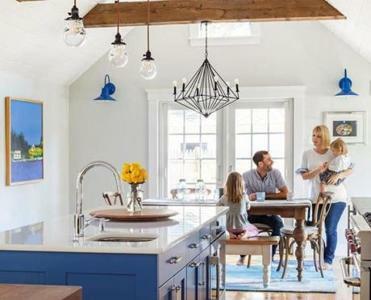 What’s more, the Cape had undergone a “hodgepodge of additions” over the previous 50 years as earlier homeowners appended and converted two garages. “We always knew the kitchen would be a project,” Lefcourt says. After living with its quirks for 2½ years, they turned to a uniquely qualified candidate to lead the renovation: Scales is Lefcourt’s sister. She made up for the lack of upper cabinets with tricks like hanging pot racks to hold pans and cooking utensils, a storage solution that also looks great. But her most crucial move was to steal 24 inches from the adjacent dining room to free up enough room for an island and easy circulation around it. The refrigerator sits in the stolen space, flanked by 12-inch-deep pantry cabinets that back up to a pair of handsome new built-ins in the dining room. Read: Think you need to rip out your kitchen and start over? Because acids from food can etch and stain marble, Scales used the stone only for the island top and its waterfall-style edges. “On the right and left of the sink, we used a manmade quartz, which is basically indestructible,” she says. “It’s really pretty” and allows for worry-free food prep. Scales also had to blend the couple’s divergent design sensibilities. “I’m very traditional and he’s super contemporary, so she really helped us meld the two,” Lefcourt says. The lighting fixtures, from Visual Comfort, strike the right balance of classic and not too fussy, Scales says. More modern touches are the Kohler faucets and Buster + Punch cabinet pulls. “I think the homeowners appreciated having a cool look for those elements,” she says. The focal point of the far wall is a 48-inch, six-burner Wolf stove with a double oven. Pot racks add aesthetic appeal while making up for the lack of upper cabinet storage. Moving the entry door slightly created space for a built-in mudroom nook, which Lefcourt loves. “It’s a great place to collect all the kids’ stuff,” she says. Think you need to rip out your kitchen and start over? Jon Gorey is a regular contributor to the Globe Magazine. Send comments to magazine@globe.com.Follow us on Twitter @BostonGlobeMag.